I planned out what we’d select last night and was super excited today to get try this elusive Smokey Bones Southern Brunch experience. This is a 5-platter brunch for $20. They also offer Sweet Bourbon Peach Tea, Smooth Bourbon Blackberry Lemonade, and single or bottomless Mimosa or Bloody Mary drinks. 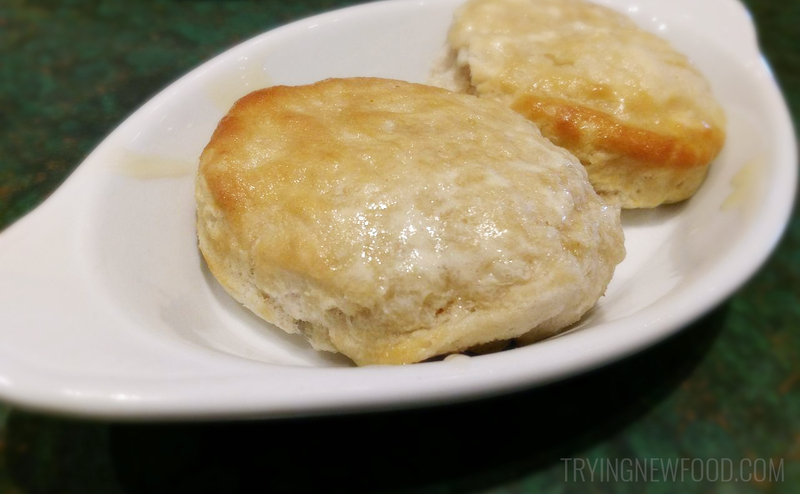 The first to arrive was the Southern Buttermilk Biscuits with Honey Butter. Since we went out for coffee beforehand, by the time we sat down to eat brunch, it was probably already past 11 a.m. and I was super hungry. So these biscuits really hit the spot for me. I did notice the insides were a little undercooked, but I didn’t really mind. It had a mild sweetness and wasn’t overly honey-flavored. Next to arrive was the Full Skillet of Cornbread. The other choice was a Large Belgian Waffle, and I think that’s what we’d opt for if we did this again. 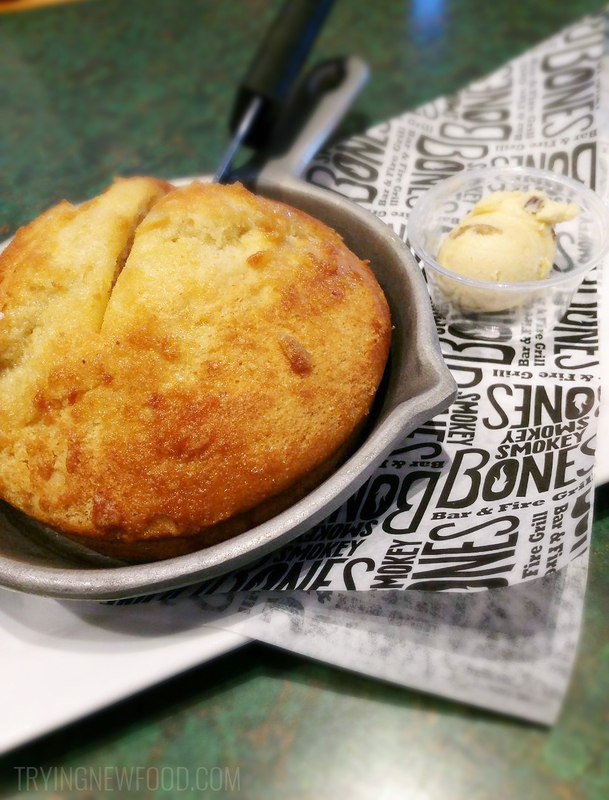 This cornbread was nothing too special and the side of pecan butter was super sweet. With the sweet cornbread, it was too much for me. We decided to wait until the meat arrived so we could eat this along with it. Finally the Baby Back Ribs and Southern Eggs Meaty Skillet with Pulled Pork arrived! 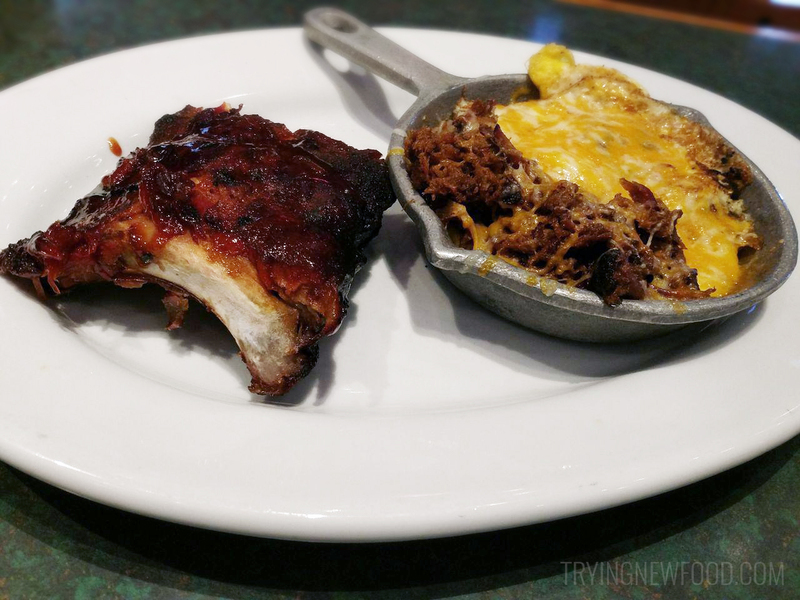 There also was an option to get 1/3 rack of St. Louis Style Ribs, Pulled Pork, BBQ Chicken or Chicken Fingers instead of the Baby Back Ribs, and you could get Texas-Style Beef Brisket, Sausage or Grilled Chick Breast on the Southern Eggs Meaty Skillet. Those baby back ribs were a huge hit! The meat might have been a little overly dried, but it had a great flavor and went perfectly with the cornbread. While eating them, we noticed the different BBQ sauce choices available. We both gravitated toward the Bones Sweet & Tangy one that had pineapple in it, but there was also Carolina Mopping Sauce, Chipotle BBQ, and Mustard BBQ. For the Southern Eggs Meaty Skillet: not impressed. The pulled pork was delicious and disappeared quickly, but it just tasted like scrambled eggs underneath. And the egg on top was overcooked, which was pretty disappointing. We’ve been spoiled with our Panera breakfast sandwiches with the wonderful runny yolks. 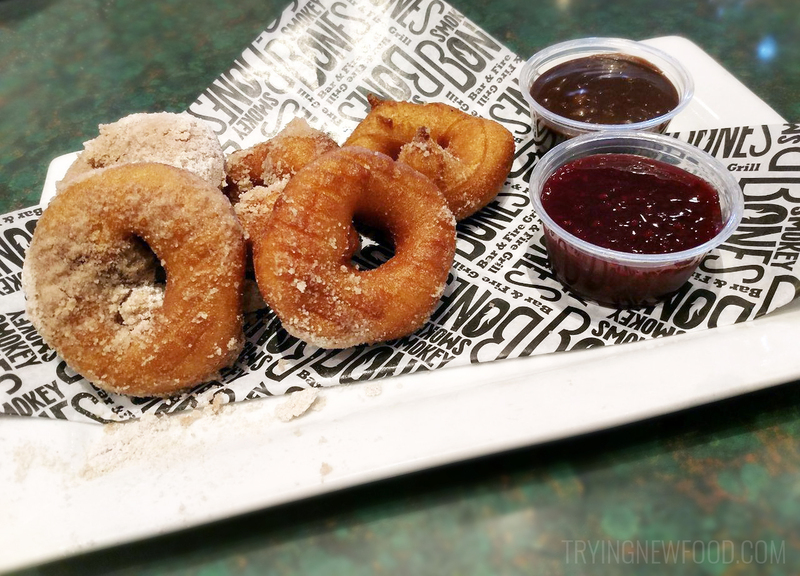 For dessert, we picked the Hot Fresh Donuts instead of the Waffle Sundae. They showed up with all the donuts in a white paper bag with lots of cinnamon sugar at the bottom. For dipping sauces, it comes with raspberry and chocolate. Both of us really enjoyed the raspberry one. The chocolate didn’t taste like anything special, but maybe I just wasn’t in a chocolatey mood this morning. All in all, we really liked the Smokey Bones Southern Brunch. It was a really unique and memorable experience. Would we go back for a second time? Probably not. But I’m very glad we went there and got to try it.